Most of us would agree that love is powerful and can be wonderful. Many people might also share the sentiment that love in the context of a romantic relationship can be a complex matter. In today’s society, there is wide spread agreement about how God fits into the love equation in our lives. When we are in trouble in our marriage or a broken relationship we cry out for his help. When we are single or separated from our spouse for any extended period we cry out because of the pressures found within our longing. Beyond that, many times we place God on the shelf in our love life like a genie in a bottle or lucky rabbit’s foot that simply has its place in our life. 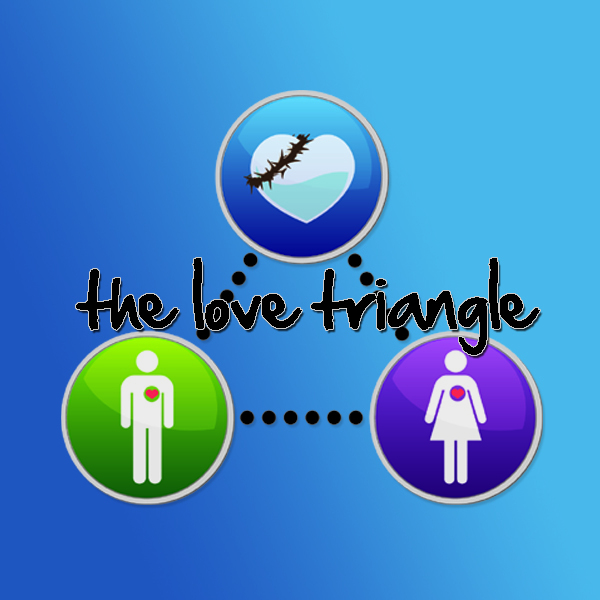 Today, I seek to challenge you and encourage a paradigm shift found through the concept of the love triangle. Much like the images found within this article, you will see that you, your significant other and God all have a position with a love relationship (if you acknowledge it or not). 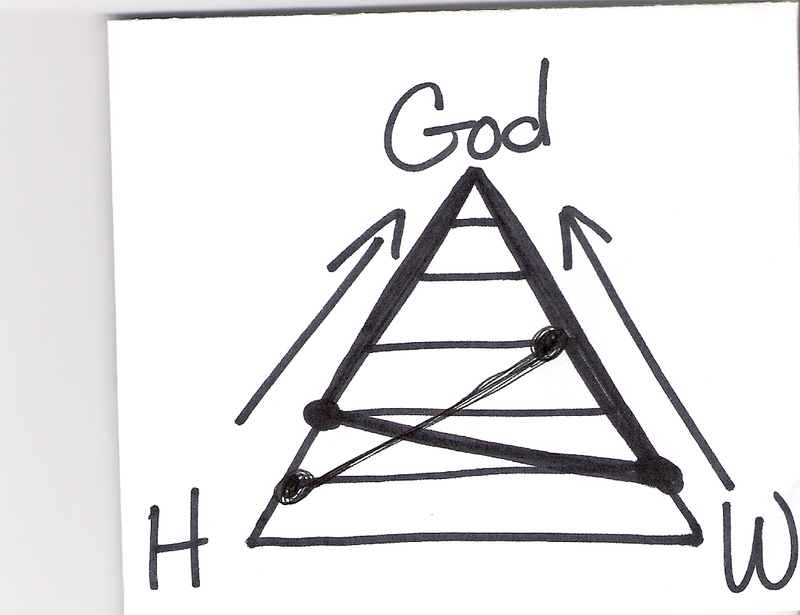 That is nothing different than the views that support God as the genie or rabbit’s foot. The difference my friend is found with two concepts associated with the love triangle. 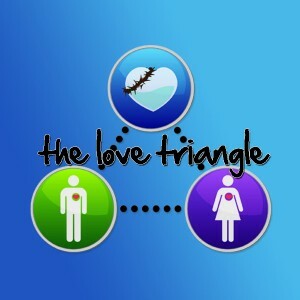 First, you will clearly see God is found at the top of the love triangle in his rightful place. I say that because if both parties are willing to submit to and seek God for leadership over their relationship, then they will both benefit by amazing growth and abounding love. It does require both parties however doing just that, not one. That concept of unity leads me into my second point. It requires that both people are headed in the same direction. If both people are individually pursuing God in their lives and deepening their relationship with him each day, they give their significant other an incredible gift. They do so by actually growing closer towards each other as they both grow closer to God. It becomes a beautiful by-product of a love for each God and each other. Conversely, if one person is walking towards God, and the other person is walking towards their significant other they are moving consistently away from each other in equal fashion though both desire increased intimacy together. Sadly, both people find themselves emotionally exhausted with a depleted love tank. 1. Fill up their love tank – by understanding their love language and committing to love them in that fashion vs. your natural tendency (or your love language unless you discover they are the same), you leave consistent, and meaningful deposits in their emotional bank account. Many times couples will have distinctly different love languages and not even realize it. See www.5lovelanguages.com for resources and a free on-line profile to find out you and your significant other’s love language if you haven’t already. It could become a great date night conversation! 2. Focus on Love AND Respect – Not only is it supported by the very word of God (the bible), this concept has simple yet profound implications when applied to your love life. If a man can seek to love his significant other with a real, agape love and the woman can focus on showing the man respect more than anything (even love), then the real magic happens. See www.loveandrespect.com for more resources to support this concept. 3. Read Ephesians 5:22-33 – God only wrote one book, and it is a good one that has been a best seller for a couple thousand years for a reason. Maybe we should read it? I encourage you to follow the footsteps of others, and if you have already read this passage, I challenge you to refresh yourself today by looking for something new in this passage as you reflect on your love relationship or the dreams of a future one if you are single. Posted in Marriage, Love & Family, Spiritual Insights and tagged god-centered marriage, love triangle, marriage restoration, marriage unity, the love triangle on September 2, 2010 by joesharp.